I just spent two days digging ten asparagus ditches. 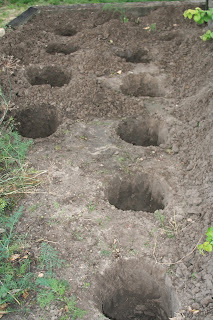 This entails creating ten holes that measure one foot in circumference by one foot deep (Some suggest digging a trench, but the holes I dug last time worked well with my partially sandy soil.). I did this same thing about 25 years ago, when I was much younger, and enjoyed freshly cut asparagus each spring until this past year when the bed suddenly gave out except for a few struggling sprouts. Once I decided to replenish the bed, I went to Gurney’s Seed & Nursery Store on-line in search of replacement plants. Finding what I felt would be the best specimen for my part of the world in the sunny/shady spot I use for my asparagus bed, I placed my order. Being a person who regularly proceeds backwards, I then went on-line to research the asparagus planting process. Hey, it has been 25 years and I am a senior citizen. Imagine my panic when every site I found reported that spring is the best time to plant asparagus crowns. I immediately e-mailed Gurney’s customer service asking if they thought I should cancel my order and reorder next spring or at least have them wait until spring to ship. A quick replay from customer service noted that I need not worry. The crowns I ordered are specifically meant for fall planting. Sigh of relief. Gurney’s customer service representative wrote back apologizing for my inconvenience, but assured me that they know where I live and that they ship according to grow zone, which in my part of the country would be mid-November. She went on to inform me that the particular plants I ordered are out of stock and on back order until November 14. She did agree to put a rush on the order and send it as soon as possible once the new stock arrives. I now see myself dressed in coveralls and snow boots planting asparagus sometime between Thanksgiving and Christmas, possibly in a blizzard. I do love my asparagus. To bad I must wait until spring to enjoy the fruit of my labor. In the meantime, we here in the high plains are enjoying the tail end of tomato season with a few straggler ears of sweet corn. Last weekend also marked the 92nd annual Haxtun Corn Festival with its “Cooking with Corn” contest although the festival actually celebrates the kind of corn generally fed to cattle or hogs. I have entered the “Cooking with Corn” contest for the last four or five years, earning a prize some of those years. Last year I earned first place, but since I made the only entry that did not seem much of an accomplishment. I thought about not entering this year, but decided to anyway. I earned a third place, quite possibly because there were at least two other entries. It was fun to get the ribbon and it felt much better having a little competition. For those interested, here is my white ribbon entry in the 2013 Haxtun Corn Festival Cooking with Corn Contest. This recipe serves one but you can can easily double the ingredients to serve two. 1. Melt the butter in a small skillet over medium-high heat. 2. 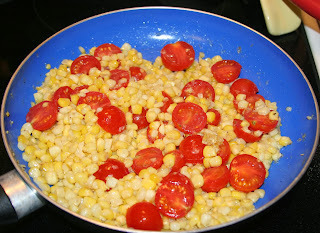 Cut the kernels from the cob and place in skillet with the butter and sauté 8-10 minutes. Toss the cob or save it to add flavor to a pot of vegetable soup. 3. Season the corn with salt and pepper and add the water. Continue to sauté until the water evaporates, 7-8 minutes longer. 4. Add the cherry tomato halves and serve immediately. Do not cook the tomatoes. 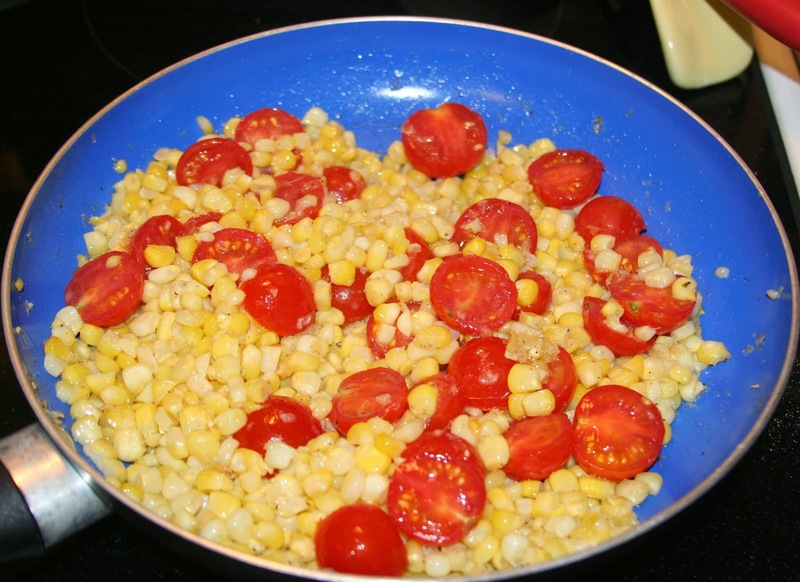 Note: Can substitute a cup of frozen corn, thawed.